Counts its history since the year 1958. The first period, created by the director Alfred Radok and stage-designer Josef Svoboda began at the world exhibition EXPO 58 in Brussels, Belgium. The programm showed in the Czechoslovak pavilion was named Laterna magika and later gave its name to the theatre in Prague, reconstructed at 1959 after the worldwide success on EXPO. 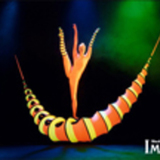 The second period was presented on the EXPO 67 in Montreal, Canada and as well as on the EXPO 70 in Osaka, Japan and with these performances travelled the theatre through the world. In the half of seventieth became Laterna magika the part of the National Theatre in Prague, on the head with the artistic director Josef Svoboda, who was at the beginning of this special medium, which does not use the words, only the combination of film projection and life stage media’s - dance, sound, lights, pantomime, black-theatre e.t.c. There is a basic effort which is creating the face of Laterna magika till today - searching of the way to a specific theatre which is able to narrate a story by using of different themes and medias as well. You are invited to the world first 3D stage show. Dancers will fly above your head, colorful fishes and butterflies will fill the theater and you just might find yourself under 6 meter giant spider. 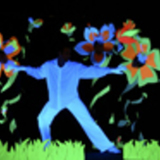 Prague’s black light theatre is at its best in this extraordinary extravaganda, that combines ultra violent light and fluorescent colors with special effects, creating a rare magic monument that will "wow" you forever! Mozart composed "The Opera of Operas" - Don Giovanni - especially for Prague and he personally conducted its world first performance in 1787 at the Prague Estates Theatre (Stavovské Theatre). 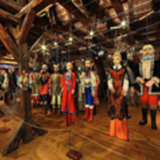 National Marionette Theatre presents this brilliant opera in the unique version using the classical marionettes. Tall marionettes as well as the stylish period costumes and original stage effects can be seen in the performance.